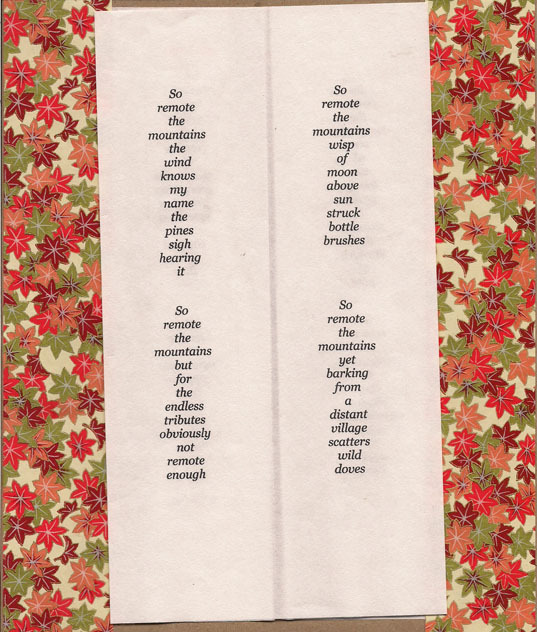 So Remote The Mountains is a limited edition fanfold featuring twelve meditations on Saigyo’s tanka, yama fukami (So remote the mountains). A Buddhist monk-poet, Saigyo (1118 – 1190) is one of the most well known and influential of the traditional Japanese poets writing in waka, or tanka, the court poetry style of the late Heian, early Kamakura era. Saigyo had written ten tanka that began with the phrase yama fukami describing the austere and remote circumstances of his hermitage near Mount Koya and sent them to a fellow monk who lived some distance away, north of Kyoto. With a few exceptions, all of Saigyo’s poems are written in the 31 syllable form of tanka or waka favored by the Japanese court of his day. The tanka is a precursor to renga and hiakai no renga (linked verse) and today’s popular haiku. Its 31 syllables are generally broken into sets of 5-7-5-7-7 syllables from which traditional haiku derives its 17 syllable format. The twelve meditations on Saigyo’s So Remote The Mountain by Pat Nolan are not tanka, nor are they technically haiku as they do not adhere to the syllabic count for either of these forms. They are probably closer to haiku than tanka because of their succinctness. However it is best to think of them as call and response. The call is Saigyo’s line yama fukami, and the response is the meditation on the line, sometimes sober, sometimes humorous, all of which emphasize a sense of isolation and distance. This limited edition of So Remote The Mountain is a fanfold printed on rough unbleached mulberry paper set in a cover of 100% recycled Bogus art paper with Japanese silk screened endpapers imported from Kyoto. The cover is an original stencil print by the author. Each is numbered, signed, with the author’s seal. The fanfold measures 3-11/16th x 8-7/8th inches (9.5×22.5 cm) closed, 7-3/8th x8-7/8th inches (19.3×22.5 cm) open. Japanese silk screened endpapers can vary from what is shown. However all endpapers are genuine Japanese silk screened paper. So Remote the Mountain is available from Nualláin House, Publishers Box 798, Monte Rio, CA 95462, for $10 (postage included) cash, check or money order (make check or MO payable to ‘Pat Nolan’).